I’m not really sure how it happened. One day I was a mild-mannered poet and children’s author from Chester County, PA, filling my days with free-verse, research, and grocery shopping. The next—I’m wearing a Carlos Ruiz red-and-white striped jersey, scanning the Philadelphia Inquirer Sports section for game stats and injury updates, and racing home from the library to catch the first pitch of the 7:05 pm game. Next to my stack of poetry collections, biographies and novels, is a dog-eared copy of Zach Hample’s Watching Baseball Smarter: A Professional Fans Guide for Beginners, Semi-Experts, and Deeply Serious Geeks. I trade post-game analysis with neighbors and discuss line-ups and trades with my husband. And just yesterday, I re-arranged my afternoon writing schedule in order to listen to an interview with R.A. Dickey whose memoir Wherever I Wind Up is a fascinating look at one man’s journey from a difficult, abusive childhood through the major league farm system, and on to the challenges and joys of being one of the game’s rare, successful knuckleball pitchers. I’m not sure if it’s the arrival of summer weather, some latent pinstripe-loving DNA, or a writer’s longing for something that addresses both a deep sense of community and the celebration of individual excellence. When you stop to think about it, watching baseball is, in fact, much like reading a good novel: it’s clear and simple enough to appeal to a diverse mass audience, yet complex enough to sustain our attention and offer a sense of continuous suspense and emotional “flow.” And so—whatever has caused me to morph into a jersey-wearing, stat-studying suburbanite, I plan to stick with the game as long as it’ll have me. How about you . . . ? Are you an MLB addict? What’s your favorite team and how did you begin to love the game? Yup…me too! 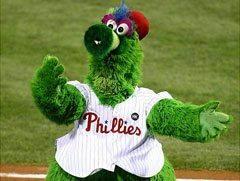 Was a Yankee fan when I was a New Jerseyite….now love the Phils since I’m now a long time Pennsylvanian! I thought it was due to having two brothers…and three sons. Maybe it’s just ‘cuz it’s a heck of alot of fun!!! I totally agree, Jen. 5 years ago I couldn’t sit still to enjoy MLB, but thanks to Utley, Howard, Ruiz, Hamels, Rollins, Polanco, Halladay, Lee, Werth, I’ve become a true fan. I watch baseball 5-6 nights a week, look up player bios on the iPad, read sports writers’ columns to get further insights into trades, strategies, and personalities! I’m addicted. My Grandma was a huge St. Louis Cardinals fan listening to their games on the radio in Southern Illinois. Grandma is probably smiling down on me…pleased we have another common thread.